Are communications between priest and penitent protected from disclosure in Canada? Rev. 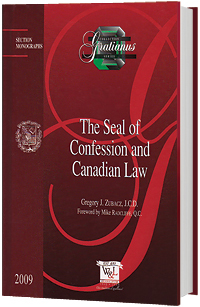 Dr. Gregory ZUBACZ embarks on a quest to answer this question by delving into the deeply shrouded and often complex history of the seal of confession and its reception in common law jurisdictions. This journey will take the reader through two millennia of world history, from the beginnings of Christianity, to the establishment of the Church, through to the Reformation, and finally into modern-day Canada. During the course of this intriguing historical odyssey, the tensions between personal spiritual privacy and the interests of the secular state to know about matters concerning public safety arc explored. This work will especially be of interest to canonists, theologians, clerics, legislators, historians, legal scholars, and anyone with an interest in church-state relations.